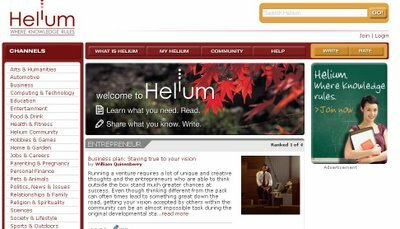 Helium to take on Wikipedia, About.com, AND Bloggers? 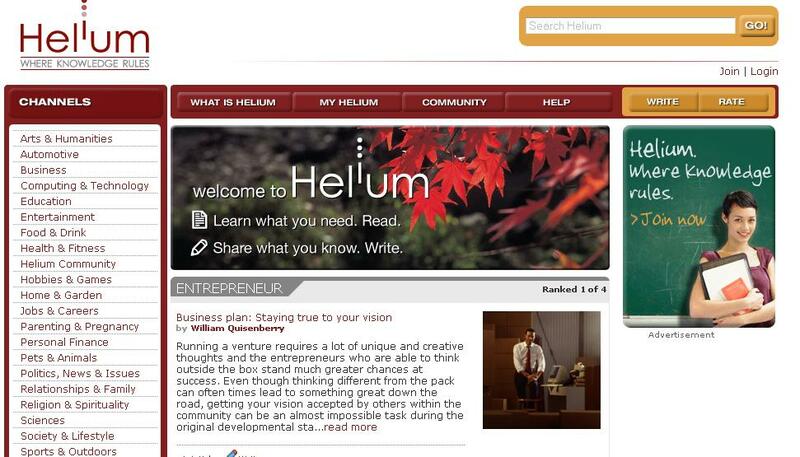 Newly launched Helium is a user-generated content site that pays users about $1 an article. The Andover-based startup has apparently attracted 7,500 writers with over 200,000 unique visitors in its five weeks of existence. Average audience member views are a staggering 20 pages. Impressive numbers at first glance. Plus, Helium gives credit to authors by posting their name on articles. To separate the wheat from the chaff, there's also a peer-review system where writers are asked to rank articles in his or her area of expertise. The pitch: About.com has fewer writers, Wikipedia doesn't give authors credit, and independent bloggers are unlikely to generate much traffic on their own. Enter Helium. So, is Helium ready to topple Wikipedia, About.com, and independent bloggers? Not just yet, First, it has to deal with contributors who take excerpts from Wikipedia instead of actually generating original content. Then, the peer-review system needs some work. Top ranked articles are often just compilations of excerpts from a bunch of a sites that a robot could generate. Like, say, this article on quantum computers, which cribs liberally from Wikipedia. Or, this article on VPNs, which takes a couple dozen unrelated excerpts and passes it off as original work. Still, at least these articles tell you they're taking content from other sites. Lest you think this is limited to the computers and technology section, sections of an article on making Bloody Marys have been lifted from sites around the web without any acknowledgment of their provenance. This article happened to be featured on Helium's homepage. A simple Google search reveals their original sources. A dollar a day isn't much for many of us, but it's a good day's wage in some countries. Even in the US, if you can pump out about eight articles every hour, you'll still be beating the minimum wage in some areas. This encourages a lot of content "repurposing". If Helium can get a handle on their peer-review system and content generation issues, it might become a worthwhile resource of information for users looking for tips on mixing cocktails or setting up a wireless network at home.